Serra da Arrábida is a national park located on the northern shore of the Sado River estuary, nearby Lisbon, and a great place to ride. The park was founded in 1976 and covers 108 square kilometres, including a mountain range with it’s highest point at 499 meters. It is also an amazing place to ride your road bike, as it is covered with some great roads, with great tarmac. The Arrábida has some great climbs, fast descents and beautiful and dramatic landscapes, over former 16th century monasteries and beautiful hidden beaches. Vila Nogueira de Azeitão is a great place to start your cycling tour, as you can try the local pastry, the sweet “tortas de azeitão” to carb and sweeten up before your ride. From the center, start pedalling west, until you reach the N379-1 road, which will take you deep into the national park, in a steady climb. It’s common to see more cyclists in these roads than cars, as the tarmac in the N379-1 is in great condition. Soon, you’ll hit some steep but short climbs – but the landscape is rewarding, as you’ll see the Atlantic Ocean unveil before your eyes. You can then take a right and descend to the beaches or keep going uphill, which you should, to head up the the convent and the top of the hill. A few km’s away, after some great curves, you’ll reach the monastery – stop by for a picture and enjoy the moment. Keep going this amazing road until you reach the peek of the mountain range, at 499m – then go downhill afterwards, in a quick, 3 to 4 km descend that is fast, with no technical difficulties except one or 2 curves. At the end of this road, take the right, twice, and go towards “Portinho da Arrábida” and Galápagos and Coelhos beaches. Here you’ll find amazing white sand beaches and beautiful turquoise water – if you can, just take your bathing suit in your jerseys’ pocket, as you might feel the urge to take a quick dive! Pedal through the tunnels and up to “Portinho da Arrábida”, a small, bay-like beach with great options for lunch. You’ll find good choices of fresh fish with daily catches in the local restaurants and great local deserts like the “torta de amêndoa” ou “.torta de laranja”. Enjoy this idilic scenery – go for a walk, or hit the beach. Afterwards, start your ride back to Azeitão, with a tough climb starting in Portinho up to the crossing with the N379-1. The climb is tough but manageable – just don’t over do it at the start of the climb! Ride back to Azeitão and enjoy the curvy roads! You can extend your ride in Arrábida and visit other spots such as Palmela and it’s historic castle overlooking the hills, visit Setúbal, in which you’ll find great options for lunch and can even take the ferry boat up to Tróia and keep riding in this amazing peninsula or visit Sesimbra and the dramatic and amazing Cabo Espichel, with it’s trademark sanctuary complex and dinosaur fossil trackways. Arrábida’s road are almost car-free, especially during the week. During the weekend, it is a go to spot for cyclists from Lisbon and Setúbal, whether on the road or for mountain biking! 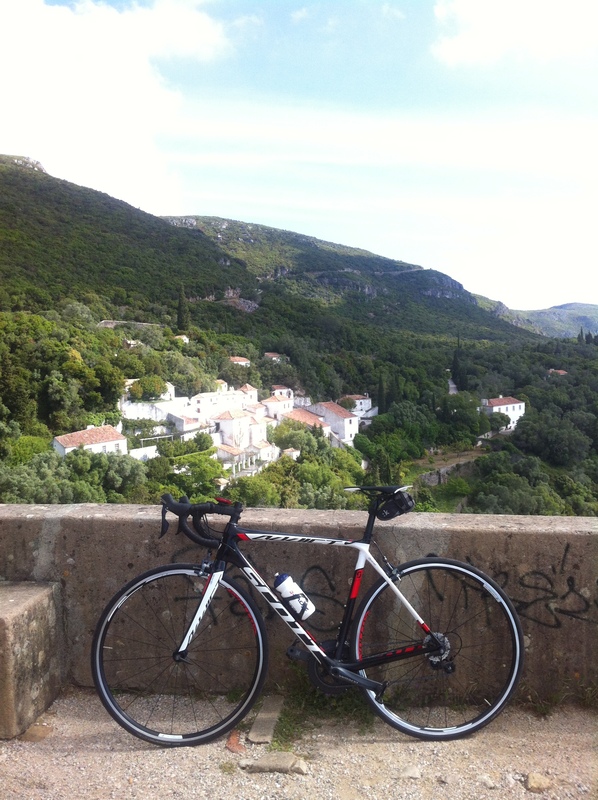 Here’s a great suggestion for a morning ride in Arrábida from one of our tours. Make sure you join our Strava club!